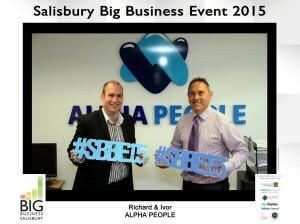 Salisbury’s annual Big Business event, #SBBE15, starts today and yesterday Simon from Simon Ward Photography popped by the Alpha office to photograph Richard and Ivor to show Alpha’s support for #SBBE15. The Salisbury Big Business Event is back for 2015 and is set to offer some fantastic opportunities for businesses of all shapes and sizes the opportunity to network, showcase and engage with both the public and the wider business community. Now in its fourth year the event is organised by Salisbury City Council, Wiltshire Council, The Federation of Small Businesses, Salisbury Chamber of Commerce, Blue Frontier, Salisbury Journal and Salisbury Business Improvement District. Held at The Guildhall, Salisbury from the 21 April until the 23 April, organisers are now putting the finishing touches to an exciting schedule of seminars, networking events and workshops. This year the event is spreading into the Guildhall Square over the course of the three days and will host popular events such as the Journal’s Recruitment Fair, the Federation of Small Business Trade Fair and a Made in Salisbury and Wealth of Wiltshire Market. We will be heading over to the event at various times over the course of the next few days and are looking forward to meeting all the wonderful and varied businesses and organisations both large and small that make Salisbury such a unique and vibrant business community.